I would hazard a guess that most cinephiles who are not students or scholars of film generally tend to be either suspicious of "film theory" or indifferent to it. But to be a serious film-lover, I would contend, is also to be interested, consciously or unconsciously, in however "non-academic" or intuitive a manner, in certain basic questions of film theory. Nearly all of the writing thus far on This is not a Film has concentrated on its political context and production circumstances — already legend — and the courageous gesture the film represents. This is entirely appropriate, but the film also holds enormous potential for future analysis by film critics as a work of meta-cinema that asks fundamental questions like: What is the difference between a screenplay and a film? (Once upon a time, in the nouvelle vague era, an answer to this question was simply: “mise en scène.”) Is the “director” of a film always a single, unified, human person? In a film, can the role of the director “move around,” in non-human form, attaching at one moment to the unexpected gesture or movement of a nonprofessional actor, at another moment to a striking setting or piece of decor that takes over a shot or scene and “rules” it? Panahi and the film take up such questions, sometimes explicitly, other times implicitly. In a wonderful pedagogical move, he plays excerpts from DVDs of three previous films (The Mirror, Crimson Gold, and The Circle) to show us supporting evidence for his arguments. 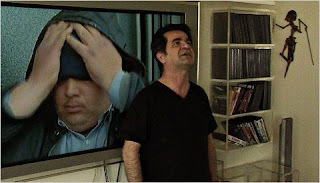 This is not a Film also stands as part of the wonderful tradition in Iranian cinema that is relentlessly curious about the relationship between fiction and documentary. The film ostensibly unfolds on a single day but was apparently shot over four days. Look carefully for the time stamp on the bottom right corner of Panahi’s television screen: it offers clues to the discontinuity of shooting and the degree of constructedness of this film. Lest I might have unintentionally given the impression that it is a dry and ‘academic’ treatise, let me quickly add that this is a very funny, surprising, and deeply moving film — but no less philosophical because of these virtues. Dreileben is a collection of three feature films made for German TV, and was shown at the festival in one continuous screening with a brief ten-minute break. It’s a fascinating experiment born of an epistolary exchange between three filmmakers — Christian Petzold, Christoph Hochhäusler, and Dominik Graf, the former two being affiliated with the “Berlin School” — that lasted two years and was published in the German film magazine Revolver. The topics of conversation included film aesthetics, film genre, and issues of national identity. The correspondence is downloadable on pdf as part of the “press book” for the film here. The three films share a single plot event: a murderer in custody is brought to a hospital to visit his dying foster mother, and uses the opportunity to escape. They weave separate stories around this event, often at its peripheries, occasionally moving to its center. The Petzold film, Beats Being Dead, employs a mise en scène that is so absurdly clean that it strikes me as humorous. The film has a detached and sardonic tone, and it’s impossible not to read its protagonist — a privileged white kid who dates an emotionally volatile Bosnian working-class girl — in a critical fashion. The film’s surprise ending was decried by some as “cheap” — but it makes eminent sense by the time the final film of the collection (One Minute of Darkness by Hochhäusler) winds its way to the (same) ending. The climactic event registers first as generic move, then as social inevitability. The endings of the two films together ask the questions: Are murderers born, or are they made? Does violence always already exist in society? To what extent is it a consequence of processes set in motion by society and the State? The Hochhäusler film (to my mind the strongest of the three) finds an equivalence between a cop losing his hearing and a hypersensitive, mentally disturbed murderer. This is a film about heightened, concentrated sense perceptions that puts the characters — and us — in a strange and uncanny awareness of the surrounding natural world. The crack of a twig, the chaotic swarm of an anthill, the crawl of a colored bug on a leaf, the smear of an animal’s blood on a man’s face — all of these register with uncomfortable vividness, their impact enhanced by the electronic soundtrack of hums, whirs and whines that is forever reminding us of the hearing loss of the protagonist. A strongly sensuous film. The third feature of the collection — Dominik Graf’s Don’t Follow Me Around — is the odd one out that fits loosely into this triptych, which is why I have little to say about it. Perhaps its virtues will become more apparent when I revisit the films: I notice they’re already on DVD in Germany. Coming soon: capsule impressions of the other TIFF films. Thoughts or questions or ideas on any of the festival films? Please feel free to share them here. -- Adrian Martin on The Tree of Life at the FIPRESCI site. Also: Adrian is the organizer of the "World Cinema Now" conference in Melbourne; it kicks off next week. -- Catherine Grant posts some wonderful videos of V.F. Perkins speaking. -- David Hudson has an 80th birthday post for Jean-Claude Carrière. Also: David has launched a new feature at The Notebook called Daily Briefing. -- Michael Z. Newman has a post about the process of collaborating with Elana Levine to write their new book Legitimating Television. -- Mark Fisher on "The Privatisation of Stress" at New Left Project. -- Arena Supplement on the films of Jean Rollin.